2017 Finish-A-Long • Quarter 4 Finishes • link up! 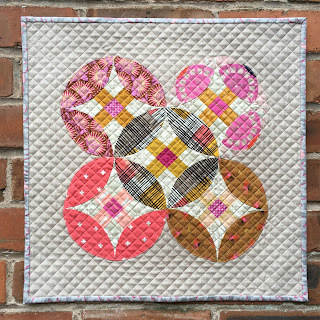 The first is this Circles Quilt I made for Sewing Quarter, with improvised curves and appliqué. I love this green/natural palette with the pop of teal, these are all Spectrum solids by Makower. The curves were cut freehand using a rotary cutter, pieced and then the blocks were squared up. I made a 3 x 4 layout of the blocks and quilted it with a simple cross hatch. The teal circles were attached with fusible web, using a blanket stitch to appliqué them - also quilting through all the layers. The finished quilt is 48 x 64". Loved by producer Hannah and my cat. You can see the demo here. The next project I'm sharing involved some different techniques, a fair bit of cutting and some folding. 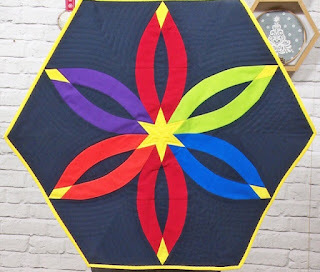 I made a smaller mini quilt using one block from the Pomegranate quilt pattern from The Versatile Nine Patch by Joan Ford. 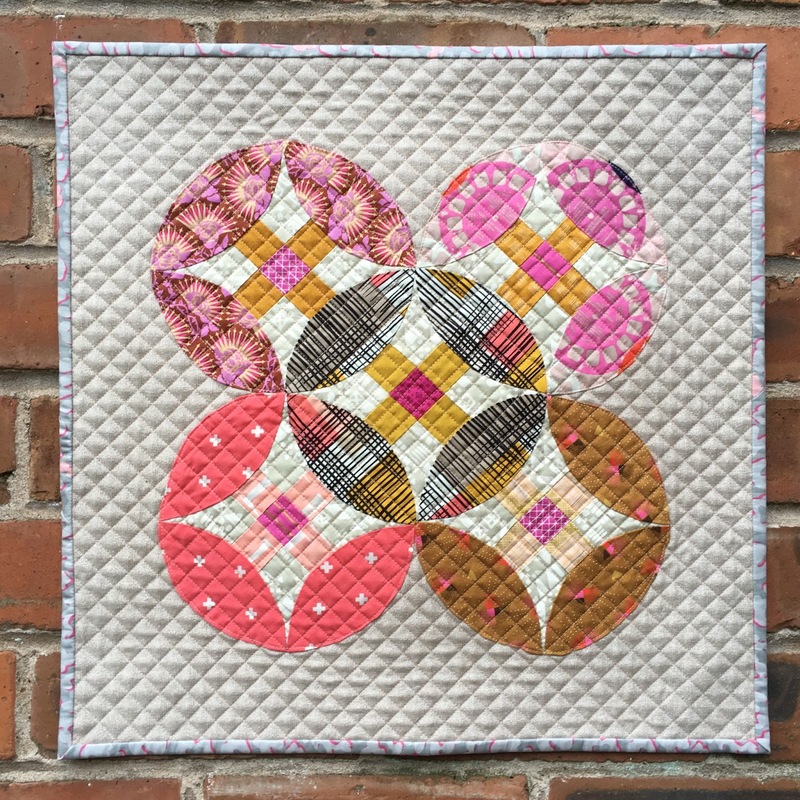 I enjoyed cutting up nine patch blocks in different ways to create this pretty design, making blocks like this sparks ideas for me and shows how many possibilities there are with patchwork. The two quilt borders sandwich prairie points, which are folded outwards to create kite shapes held down with little buttons. I have recently fallen in love with prairie points and like this different take on them! To watch the demo click here. I had an exciting delivery, the December box from Modern Quilter's Box. Filled with beautiful fabric and patterns, it is such a treat! This month my Crossed Orange Peel was included in the box (which is now sold out but stay tuned for the pattern release). I adore this sweet embroidery kit that was in the box, Noel by Cotton Clara. It was really quick to make and this is now hanging in our hallway! I didn't make any other festive decorations for our house this year, just broke out the box of mostly handmade Christmas decorations. I did, however, make a couple for my friends Samantha and Naomi using this great video tutorial by Art Gallery Fabrics. I really like how these combinations worked out! The fussy cut Tula peeking out through the festive red, the lovely Essex metallic texture with the black Gramercy print and I used different colours of Aurifil Brillo metallic thread to add sparkly stitches to both. On a personal note we enjoyed a wonderful Christmas day spent with my Dad. The kids got to decorate a little tree while we made lunch. Oh and that was after they had helped dig up veggies for lunch! Fresh carrots and sprouts! It was a special day, full of good food, laughter and gratitude. My favourite gift was a cardboard box full of stationery that my husband had collected from various shops - so thoughtful! And as I use notebooks, pens, washi tape etc every day I know that it will be fun to get creative with all the things he picked out for me. This weekend we plan on having a few games of Pictionary, given to us by my best friend. I grew up playing lots of board games and beyond Monopoly (which my husband hates) and tiddly winks (which, it transpires, none of us can actually do), we don't really play games like that. I'm looking for to it! Yesterday I was back to work and one of the projects I created was this book cushion. I used alphabet templates and Sublime Stitching embroidery floss to stitch 'read' with back stitch. The lined pocket was made very simply, using fusible fleece and just a couple of lines of stitching across the top. Fusible fleece is my favourite thing to use when making cushions, it does the job of interfacing/wadding, is so easy to iron on and gives a nice soft structure. If you'd like to see the demo, which includes the measurements I used, click here. Finally I had to laugh when I got a coffee on my way home today and noticed this is how they had spelt Lucy!! The kindness of our community always surprises me! Lovely Naomi asked if she could send me a little gift after discovering that penguins are my favourite creatures. I was thrilled to receive this adorable Christmas decoration, with beautiful fussy cut penguins! It's been a busy week for lots of reasons and of course there is always plenty of sewing involved. I have been working on projects for the Sewing Quarter, including classic designs and techniques, creating my own pattern and a felt hand sewn make! On Thursday 7/12 I was demonstrating the Creative Grids Diamond Wedding Ring templates. I adore this traditional pattern and the templates make it far easier to prepare the pieces and the accuracy of cutting makes piecing spot on! 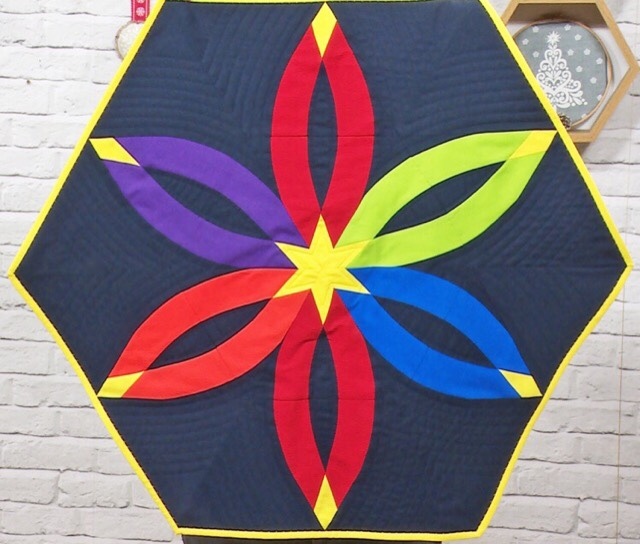 For a bold look I chose a rainbow of solid colours with a dark background and enjoyed doing some simple curved echo quilting in navy. I decided to use a decorative machine stitch on the binding, it adds a bit of fun and I found one that worked well with the diamond theme. It's actually a utility stitch but it looks great! Every Saturday I join Meg and Rachel in hosting the Saturday Night Craft Along on Instagram. It's an amazing community of makers, encouraging each other and crafting the night away! This year we decided to have the first (in what we hope will be at least annual) swap. With three time zones joining in each week, it was quite the task to organise but we mixed it up and became swap mamas for other continents so we could join in the fun! My swap partner was Jen aka Mum In The Madhouse, who I met this year at the Simply Solids retreat! So I already knew she loved Anna Maria Horner and I wanted to make her something to help her unwind and relax. She works really hard, her blog is full of amazing inspiration, ideas for family activities and so many brilliant posts! 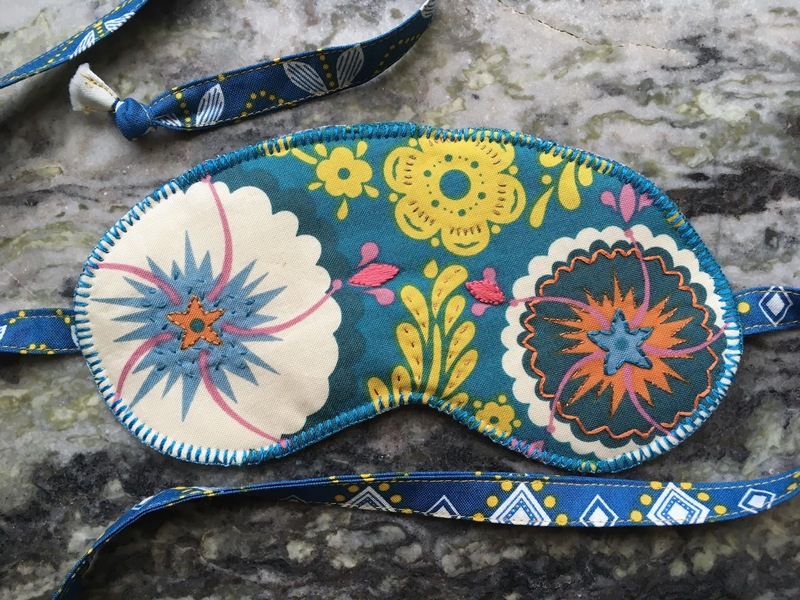 After seeing an instagram story she posted about having trouble sleeping I knew exactly what to make and gift her. Happy December everybody! It definitely has started to feel like winter here but I'm trying to stay toasty, wearing my log cabin slippers and (handmade by mum) knitted jumpers. I have some exciting things coming up this month, starting with this new pattern!